A new paradigm for marketing attracts your perfect customers and inspires them to take desired actions. How do we do it? By consciously using the Law of Attraction. Millions of people are talking about the ancient knowledge of the Law of Attraction that has gained global popularity. The law is that we attract everything that is in our lives, whether consciously or unconsciously. We do this through the focus of our thoughts and how we integrate those thoughts with aligned actions. The goal behind the wide-spread conversation is how to consciously attract what we desire. My take on the conversation is how to integrate the Law of Attraction into our marketing so that we attract the ideal clients to us and experience business in a new way. The first step to infusing your marketing with the law of attraction is to create your own Attraction Plan. The Strategic Attraction PlanTM (SAP) is a simple 4-part process that empowers you to attract perfect customers and relationships. Using the SAP we can literally put our order out to the universe for whatever we desire to attract, and thus become a magical magnet for the life of our dreams. I use the SAP to guide entrepreneurs in creating a Magical Marketing Plan that reflects their true passions, Branding from the Heart that expresses their mission in a way that promotes everything they’re up to, and Wildly Attractive Websites that spread the word to the world and inspire their perfect customers to take desired actions. Visit http://www.magicalmarketingtoolkit.com to download an Attraction Plan Worksheet and watch 2 short instructional videos on how to imbue your marketing with attraction. The Sufi poet Rumi said, “What you seek is seeking you.” In my case, I am seeking perfect customers, and they are seeking me. This makes me excited to think about. I love to imagine those folks who are looking for exactly what I have to offer, to think about what qualities they have, their personality, how excited they’ll be to find me, how much fun we’ll have working together. Of course they must find me first. That’s where marketing comes in. The first question is ~ What to say in our marketing? In the old paradigm for marketing we would have invented some hype designed to brainwash or scare someone into buying from us. But our perfect customers will never recognize us if we are surrounded by hype and fakery. If we are to enjoy life, as entrepreneurs we must enjoy every aspect of our business, including our marketing, and that kind of hype runs counter to a fulfilled life. there is a desire to fulfill our life purpose. For some that may be a passion for service, for others it may be a strong creative drive, and yet others may be motivated by freedom for themselves and everyone on the planet. No matter what the soul’s calling, I have seen that it is the source for the entrepreneur’s most attractive ideas. Share yourself authentically. Whether you are writing articles for your newsletter or Blog, creating your website copy, or writing an ebook, make sure you’re writing from the heart about something you really know and care a lot about. Not only will you be fulfilled in the activity of clarifying your purpose and sharing that with the world in your own personal style, you will begin to attract customers who are already aligned with you and ready to take the actions you desire. When you are sharing yourself authentically, you will want to use words that reflect your purpose. These can be words that give you the shivers, that you love, that you use often when you are speaking freely. Some of my words are Beauty, Freedom, Magic, Creativity, Love, Transformation, Wild, Authentic, Attraction, Conscious. What are the words that describe your purpose? Use these words often in your marketing for as they resonate with you, they will also resonate with your perfect customers. These words may just be the words your perfect customers will use to find you. Use your favorite words as your own Magical Keywords . Use them in your titles, in the content of your articles, in the headlines, and in links and see who is attracted to you. One day TV Host and 5-time NYT Best Selling Author Iyanla Vanzant called me on the phone asking for help with her website. This was 2 weeks after I had written down that I wanted to interview her for a book I was writing at the time. When we spoke, she confirmed that it was because I had put that word MAGIC next to the word MARKETING that inspired her to call me. You will be on a wonderful adventure of attracting like minded souls who are seeking what you have to offer. Everyone needs a blog and a website these days if they want to attract customers online. You want to make sure that your home base is a great representation of your personality, your purpose and your gifts. 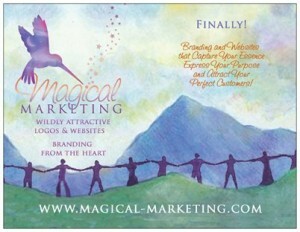 When we create websites at Magical-Marketing.com, we use the power of the Law of Attraction along with collaboration to create Wildly Attractive Websites that truly reflect our clients’ missions. There are so many fabulous places to market yourself for free these days ~ a world full of free Blogs, Social Networking Sites like Squidoo, Hubpages, Craigslist, and there are Article Marketing and Bum Marketing sites that will deliver your articles to folks looking for content… the possibilities for sharing in the net go on forever. What makes posting on these sites so effective is that they are considered “Authority Sites” and get high ranking on popular search engines Google and Yahoo. You can post one day and appear on Google in a high ranking (using your magical keywords) in the next. All of marketing is a gamble. You never know what will catch on and what will be ignored. So taking actions and taking risks is inevitable. With the web, the only thing you are risking is your time. Time spent sharing your purpose is always time well spent. The perfect customers you will attract are just icing on the cake. Candi Taylor-Seter will be interviewing me on her radio show Career Astrology Radio on Wednesday, November 14, 2012 at 9am PT / 10 am MT / 11 am CT / 12 pm ET. The topic will be Infusing Your Marketing with the Law of Attraction. Visit Candi’s Blog Talk Radio page and follow her to receive reminders, or just visit the show page at airing time. Our time together is short so we will be on air again the following Wednesday to answer your questions. Laws of attraction is the most fundamental laws in this universe, that everybody is using. Nice post friend, you might find my blog interesting too. Yes, the Law of Attraction really works, but it reflects our dominant and most practiced thoughts. We can’t spend 5 minutes on a new thought and 23 hours and 55 minutes thinking the old thoughts and have anything change. That being said, we can simultaneously be positive and believing while also maintaining a healthy degree of scepticism. The Law of Attraction is not about ignoring common sense. We must also understand that the Universe works at its own speed. Although instant manifestation may sometimes happen, our desire will manifest in the universe’s timeframe rather than ours! It could even be that the universe knows that we are not yet ready to receive our desire. Thanks for your comments, Shanna. I agree that we can’t be negative most of the time and expect a few minutes of positive thought to get us where we want to go. My main focus is in helping entrepreneurs be truly authentic in their website … even to the point of being painfully vulnerable… so that their perfect customers can 1) recognize them and 2) are intuitively drawn to connect with them. 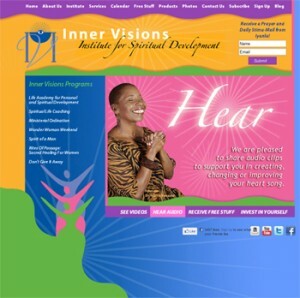 So many who understand the Law of Attraction don’t understand the importance of authenticity in ensuring their dreams are realized through their website. Thanks again for your insights!